Copper futures trading in New York surged on Monday on renewed optimism about the strength of the Chinese economy going into a crucial policy-setting meeting of the country’s leaders. Copper on the Comex market for delivery in December added 4% from Friday’s close touching 3.2595 a pound ($7,186 a tonne) in early afternoon trade, the highest since February 2014. It was the sixth straight session of gains and volumes were well above the daily average with more than 4.2 billion pounds (1.9m tonnes) of copper traded by 2pm. 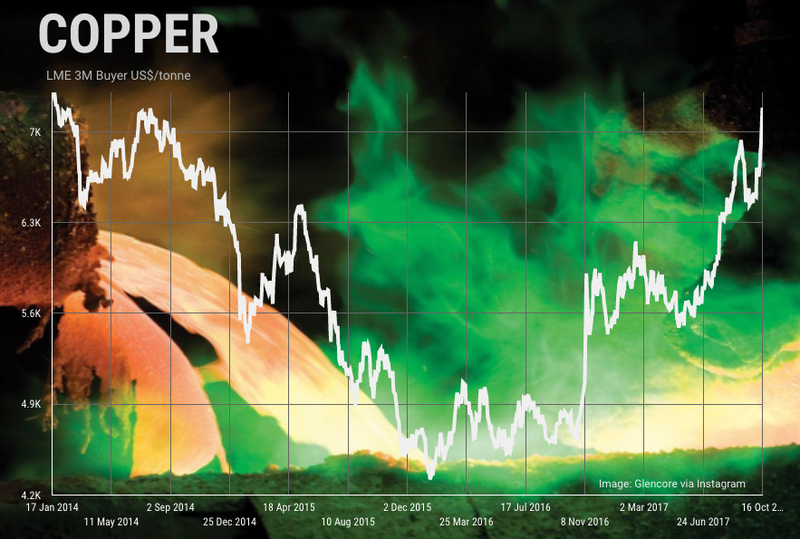 Year-to-date copper has risen 29% in value. The 19th National Congress of the Communist Party of China which opens on Wednesday will determine the economic goals for the country and could have a significant impact on copper and other industrial metals as authorities continue to tackle the country’s pollution problems. Data released over the weekend showed Chinese producer price inflation rose to 6.9% in September compared to a year ago. The main driver has been metal prices which have risen in response to resilient infrastructure spending, capacity cuts and speculation over future market tightness, Capital Economics said in a note. According to Beijing Antaike, a state-run consulting company, China's 2017 national copper concentrate demand is forecast to rise at double digit rates this year to 6.1m tonnes. Domestic Chinese copper concentrate output is forecast to expand to 1.65m tonnes, up from 1.614m tonnes in 2016. Copper concentrate imports with 25% metal content is estimated to total 4.5m tonnes in 2017, some 240,000 tonnes more than last year.